1. Place chocolate pieces in a small microwave-safe bowl. Microwave on 100 percent power (high) for 1 minute or until chocolate is melted, stirring twice. 2. Hold cherries by the stem and dip, one at a time, in melted chocolate to coat. 3. Place coated cherries on a large baking sheet. Immediately press the flat bottom of a kiss up against the cherry (forming mouse head). 4. Insert two almond slices between head and body to form ears. 5. Use a toothpick dipped in remaining melted chocolate to make eyes. If you like, dot some of the melted chocolate on tip of kiss for nose. (Or, place remaining melted chocolate in a resealable plastic bag; seal. Snip off a very small piece of one corner and pipe on eyes and nose). 6. Place the baking sheet in the refrigerator and let chill for 15 minutes or until chocolate is set. 7. Use a small flat metal spatula or table knife to help remove mice from baking sheet. 8. Store mice in a tightly covered container in the refrigerator for up to 2 days. 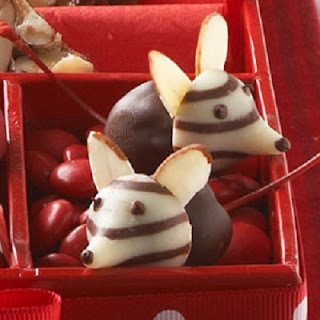 I'm super excited to make these adorable little treats! I think they'd be perfect for Christmas! Are you guys making them? Send me your pics, I'd love to see the results.